By any assessment, Esther is a rather strange book to find in the Bible. Not only is it, along with Daniel, the only book of the Bible to be set entirely outside of the Promised Land, it also shows no interest in that land. More than that, Esther is the only book in the Bible which definitely does not mention God. None of this should be taken as meaning that the book has no theological intention--on the contrary it has a developed theology, but it is a theology which operates precisely because it does not mention God directly. 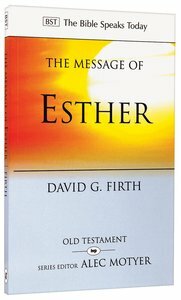 About "Bst: The Message of Esther"
By any assessment, Esther is a rather strange book to find in the Bible. Not only is it, along with Daniel, the only book of the Bible to be set entirely outside of the Promised Land, it also shows no interest in that land. More than that, Esther is the only book in the Bible which definitely does not mention God. None of this should be taken as meaning that the book has no theological intention--on the contrary it has a developed theology, but it is a theology which operates precisely because it does not mention God directly. In this volume in the Bible Speaks Today commentary series, David Firth explores this paradoxically important book and its implications for our own contemporary context, where the reality of God's presence is experienced against a backdrop of God's relative anonymity and seeming absence. David G. Firth (Ph.D., University of Pretoria ) is Old Testament Tutor at Cliff College. David has experience in pastoral and evangelistic ministry in his native Australia, as well as seven years with the Australian Baptist Missionary Society in Zimbabwe and South Africa. His research interests are in Old Testament ethics and mission, with a particular focus on literary issues associated with narrative and poetry. He has written widely on these areas both in articles and in his books Hear, O Lord: A Spirituality of the Psalms (Calver: Cliff College Publishing, 2005), Surrendering Retribution in the Psalms: Responses to Violence in the Individual Complaints (Paternoster, 2005), and Interpreting the Psalms: Issues and Approaches (ed. with Philip S. Johnston) (IVPress, 2005), and 1 & 2 Samuel (Apollos Old Testament Commentary Series); The Message of Esther (The Bible Speaks Today Series), and has recently become general editor for the New Tyndale Old Testament Commentary series.